Short Business Description: Tulsa Oklahoma Divorce Assistance. If you’re looking for online Oklahoma divorce forms, it’s because you want to reduce the time and expense that typically goes along with divorce. Unfortunately, many people who start out looking for do-it-yourself divorce find themselves bogged down by complicated laws and procedures they knew nothing about. They wish they had an attorney’s help, but don’t want to pay for repeated office visits and a long, contentious divorce trial. Sometimes, people who buy do-it-yourself divorce kits wind up filing divorce forms that courts flat-out reject. Or worse, they file divorce papers that give up more than they intended, or inadvertently sign documents that don’t protect their most vital interests. We’re here to offer a simple solution. We’ll help you determine if a drafting service is suitable for your divorce. We’ll work with you to define the terms of your divorce. Then we’ll draft divorce papers that meet the requirements of Oklahoma family courts. The process is fast and simple. Your divorce forms can usually be completed during the first appointment. We can even complete the process by telephone. 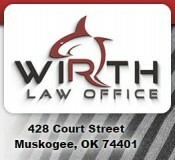 Short Business Description: Wirth Law Office – Muskogee is a division of the Wirth Law Office dedicated to meeting the legal needs of Muskogee County, Oklahoma. The Muskogee lawyers represent Muskogee County residents and those with legal matters pending in Muskogee County District Court. The Muskogee law office extends service to residents of Muskogee, Oklahoma. Legal representation for Muskogee, Oklahoma in the areas of divorce, custody, criminal defense, family law, bankruptcy, personal injury, workers’ compensation, estate planning and more. Business Website Address: Attorney in Tulsa, OK.
Business Address: 428 Court St.